The Distributed Checksum Clearinghouses or DCC is an anti-spam content filter that runs on a variety of operating systems. As of the middle of 2007, it involves millions of users, more than six hundred thousand client computer systems, and more than 250 servers collecting and counting checksums related to more than 300 million mail messages on week days. 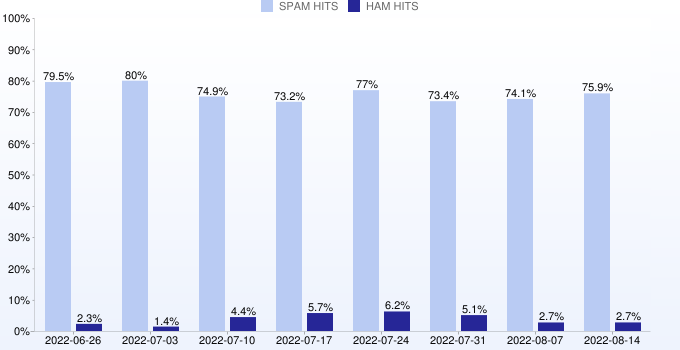 The counts can be used by SMTP servers and mail user agents to detect and reject or filter spam or unsolicited bulk e-mail. DCC servers exchange or flood common checksums. The checksums include values that are constant across common variations in bulk messages, including personalizations. Visit the Blacklist Monitor mainpage for more blacklist statistics.